This aubergine dip with tahini and pine nuts is quite a stunner when served with pomegranate arils on top. It is a a good way to include more vegetables into your diet along with nuts and seeds. You can dilute the dip a little to make a cold soup as well. The dip is a variation of the Greek baba ghanouj or baba ganoush, you can always tweak it to your taste and availability of herbs and nuts. This aubergine dip goes well with any crackers, pita chips or fresh pita bread or even crisp parathas. It stays well in the fridge for a week or so. Try the leftovers on cucumber slices, you will be surprised with the taste. 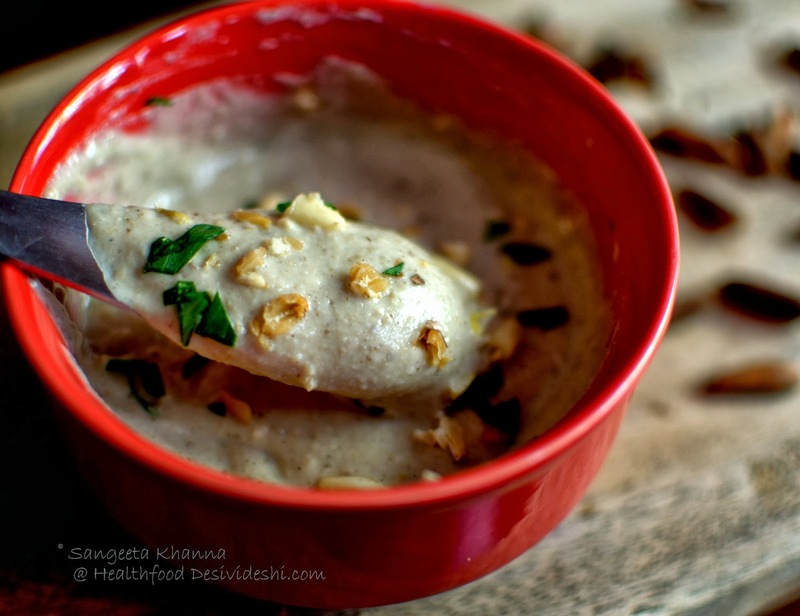 picture recipe | aubergine dip with tahini, hung curd and pine nuts.. The dip looks super duper creamy and delicious! Delicious! Healthy and vitamin packed. looks like an winner dip to me..will try out and let you know how mine turned out!! Lovely flavours and taste for sure - did you make the tahini yourself too?